Five years ago, I went inside the gates of Hansen House. It was deserted, run down and dreadful. In 1887, the Protestant community in Jerusalem had built a leprosy asylum. Over the years it had become run down and was closed. Renovations on the large structure to be used as a new culture and technology center in Jerusalem, Israel, are not completed. 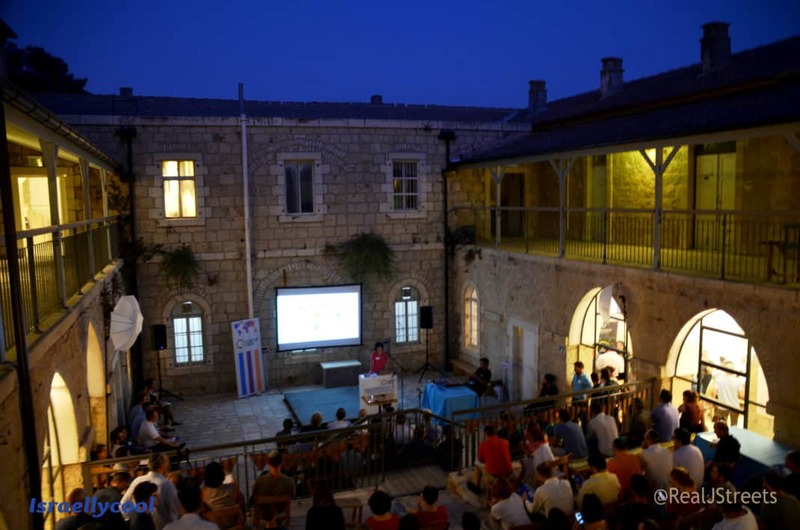 However, tonight the inner courtyard was filled with people to see and hear the finalists of a StartUp Open competition. Frank Mobile App allows users to give and get back constructive, anonymous feedback from friends. Guide In Medical a new Intubation device identifies & navigates into the trachea in difficult situations. InnerEye has visual target detection capabilities by combining the human brain and computer vision. Lishtot is a water quality testing technology and device for answering the question “to drink or not to drink?” in real time. PlayClay is a platform, which enables the creation of various games and applications for direct and intuitive 3-D modeling of soft materials. SmartLogic maximizes industrial machine up-time by “listening” to machines and predicting future failures. All the presentations were fascinating. Start Up Nation and amazing technology in the Old Hansen Hospital, with Wifi and more. I love the old and new of Jerusalem.